This show was broadcast on October 24, 2014. 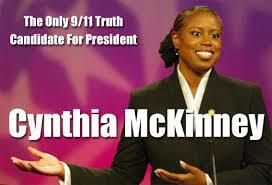 Former six-term congresswoman and 2008 Green Party presidential candidate Cynthia McKinney is not your ordinary politician. Her uncompromising commitment to principled truth-seeking sets her apart from virtually all other federal office holders of my lifetime. In this interview we discuss the ebola scare; the Empire’s ravages in Africa and Latin America; the “deep state” described in Peter Dale Scott’s The Road to 9/11 (Peter is on Cynthia’s dissertation committee – she’s finishing her Ph.D. work on Hugo Chavez); false flag events including 9/11; and whether Dr. Cynthia McKinney may run for president one of these years. This entry was posted on Thursday, October 23rd, 2014 at 8:02 pm	and is filed under 9/11, Anti-War, Censorship-Propaganda, False Flag/Fake Terror, Freedom, Justice, Kevin Barrett, News, Protest, War Crimes. You can follow any responses to this entry through the RSS 2.0 feed.